There's much debate over which of the Brick Lane bagel shops is better: The Yellow One (this one) or The White One (Beigel Bake). And you'll find patrons fiercely defending their choices with arguments including: The Yellow One has been here longer (over a century longer, in fact), but it sells bacon, which White One fans will dub un-Jewish and blasphemous on a bagel. The truth is, they're both as good as each other, especially when those hunger pangs surface in the early hours and can only be satiated by a salt beef bagel. We suggest simply joining the shorter queue. The only reason it doesnt get a five star from me is because they only take cash which one may not have at that time of the morning/night but they were very cheap so it won't dent your pockets at all. 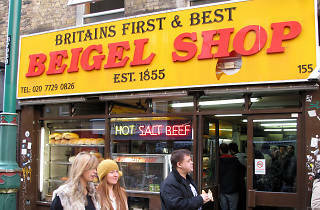 Straight after having my nose pierced, I head down to the Beigel Shop and enjoyed the delicious salt beef goodness. The service was fast, the bagels were not expensive and fully loaded. Amazing East London goodness. Hands down the best bagels in town! I'm a simple woman who just loves her smoked salmon and Philadelphia bagel, but there's plenty of choice to make belly groan. It's a get in get out kind of place, very authentic, street, and perfect for a little snack if you're passing by brick lane. I have so much love for the Beigel Shop! The beigels here are wonderful - chewy and soft - and the staff are lovely. They're terribly generous with the salt beef and for around £4 it's one of the best bargains in London. The lox and cream cheese beigels are gorgeous as well. I've even gone off piste and tried their rainbow beigels (sweetish), rainbow croissants (yum), samosas (AMAZING), cheesecakes (what's not to like) and apple turnovers (so much spice!). The queue is long but the turnover is quick. Just go! Yellow wins over White for me. If we weren't all in for the occasional gimmick then half of London's 'must-see' locations wouldn't exist. The Beigel Shop is no exception. From rainbow beigels to the new rainbow croissants along with it's traditional salt beef, this is a cheap and cheerful bakery worth stopping by whilst in Brick Lane. What the baked goods lack in flavour and nutrition, they make up for in low cost. Get in early or prepare to queue. Usually the quieter of the two most well known bagel stores in Brick Lane (if not London), 'Beigel Shop' has practically the same offerings and prices as it's nearby counterpart, but it also does a fine line in 'rainbow' croissants (pic enclosed). After this and the previous rainbow bagels (as seen in 'The Apprentice'), where to next? If you visit at the weekend, expect to queue out the door (much quieter in the week). As it is a takeaway shop so there wasn’t much to the atmosphere and decor. Everything was kept simple, including the food on display. Everything on display was labelled and placed strategically. I liked that each slice or piece of patisserie was generous in size and they genuinely all looked delicious! There was quite a variety too; brownies, muffins, pastries, viennoiseries, etc. However, as the name of the shop would suggest, we went for the bagels. The rainbow bagel was only £0.50 per bagel and you could put any filling you wanted in it. We both went for a classic, smoked salmon and cream cheese. I enjoy this combination because the cream cheese provides a nice creamy base to the bagel, so that it’s not so dry. The smoked salmon has such a strong and savoury flavour that not much else is needed and that’s why it pairs well with cream cheese, which has a comparatively mild flavour. Our bagels were still warm when we got them, which made them even more delicious but I would have liked them toasted as well. I actually prefer the North American styled bagels which are more crunchy from being toasted, compared to this bread-y version. Yet, these bagels tasted fresh and having it in a rainbow bagel made eating the sandwich more fun! The service was actually really nice, our server was very friendly and lovely. She took orders quickly and had them made just as fast! It’s a cash-only shop, so come prepared. There might be a queue when you arrive but it moves swiftly, given how efficient the servers are and how easy it is to make the different bagel combinations. Breakfast, brunch, lunch, dinner or at 3am after a few too many, a bagel from this institution on Brick Lane will forever go down a treat. What's more is that no matter how crammed full it is with salt beef and gherkins, salmon and cream cheese or even egg and bacon, it'll never set you back more than a fiver, making it a stroke of genius every time you find yourself wandering the streets of East London hungry and it dawns on you to bagel. I hope my children's children will experience the same satisfaction. Cheap, cheerful and great fresh bagels and fillings. Just wish they'd spruce it up a bit to include some half decent seating. Super excited that I finally got my rainbow bagels! This is the place of the first ever all-around-the-world rainbow bagel! You own a bagel shop in Brick Lane, you do properly your job delivering tasty bagels but a bagel shop just two shops away from you is taking all of the customers...What should you do? Think clever to beat competition; invent the colorful bagel! As great as it looks, the same great it tastes. Try in on salty beef and of course you will love it. The shop itself is as any other bagel shop, there's absolutely nothing different or special about it but I guess that is part of the charm. The (normal) bagels are actually really good and the rainbow ones are visually impressive (can't decide if impressive good or bad) and taste pretty much as the normal ones. Beigel Bake is well known for a reason! Proper kosher style chewy bagels with sweet and savoury fillings. The classic is the hot salt beef, mustard and pickle. They also do a mean smoked salmon (and even add a squeeze of lemon and twist of black pepper). Open 24 hours, Beigel Bake can satisfy your bagel craving any time. It is also ridiculously cheap. It's pretty grim aesthetically, but it's brilliant deli food and definitely worth a visit if you're in the area. My first bagel on Bricklane! And what other choice did I have but to get the famous rainbow bagel. It is little over a £1 and served on its own although I think you can pay a little extra to get butter & jam. I liked the consistency, it had a good level of cinnamon in it which was good even though it must be packed full of colourings. I probably wouldn't get it again but would recommend giving it a try. They also serve bagels with TONNES of other fillings - the more simple like peanut butter to the more filling and flavourful. I saw someone with the salted beef and it looked amazing! It took a jump onto the rainbow bagel bandwagon to get me to make the effort to travel east and visit the infamous bagel shops on Brick Lane. I love bagels but usually would never bother venturing to that end of town for something so simple (it's a difficult end of town for me to reach) but with a free afternoon I figured this was the time to make the effort, and also those rainbow delights belonged on my Instagram! I'm aware of the competition between this place and Bagel Bake but as the latter doesn't offer these colourful infusions, I left my friend to queue for one of their bagels and I joined the queue for the bagel shop. The queue was a lot shorter for mine which I found curious - I feel like London knows what places are worth queuing for and I began to think that maybe the other place was better... But then I remembered rainbow and figured, surely not. There was only ever going to be one filling I was going to opt for: the salt beef wth mustard ad pickle. £3.70 is a bloody bargain for the amount of salt beef that they pack into these bagels. Especially when you consider how expensive it is in places like The Brass Rail in selfridges! They couldn't have given me more salt beef if they tried, and it was warm and juicy and tender and pink and OH MY GOD just incredible! The bagel itself, well it was pretty... But it was also soft and a bit gooey. With every bite it stuck to my front teeth so I looked like a toothless Victorian prostitute every time I smiled! Perhaps these bagels would be better toasted because soft, they just aren't able to harness the wet meaty filling. That's not to say I wouldn't return and devour another one of these right now if I could (in fact, I returned a week later but this time opted for a plain bagel). While the queue was shorter in here, it still took a while to be served. Bagel Bake has a very regimented serving technique- they work together, pre prepare the popular bagels and the queue while long does go down quickly. Bagel shop however is a bit slow, no one works together and I think that may be where the they places pips them in the leaderboards of which place is best, because from a bite of my friends bagel, I'd say they're neck and neck in the flavour departments! A stroll down Brick Lane is always an enjoyable treat for the senses. Lots of wonderful sights to take in, smells to enjoy and would not be complete without satisfying your taste buds by sampling one of the fine and well-renowned brick lane beigels (yes beigel NOT bagel, don't have the Londoner's laughing at you). As you are told from the front of the shop, Beigel Shop is Britains first (fact est.1855) and best (up for debate depending on who you are talking to) beigel shop on Brick Lane. 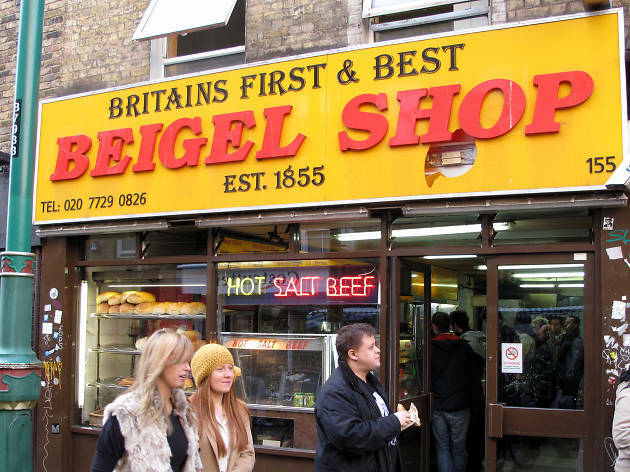 It's competition lies right next door in the form of Beigel Bake which is a 24/7 beigel shop that seems to take most of the credit for the highly acclaimed beigels of brick lane. In my opinion, my loyalty lies with the Beigel Shop and I'll tell you why. 1. Depending on when you visit the beigel region of Brick Lane, you are more than likely confronted with lines snaking down the street into these two beigel establishments. For some reason the beigel shop usually has a shorter one and the line moves quicker. 2. Personally I rather the atmosphere in the Beigel Shop. The women behind the counter I find extremely friendly and always welcoming conversation, compared to the gritty shouty women manning the Beigel Bake, who are a joy also but seem more under pressure from their lines. 3. You also get a closer view into the actual bakery to see the beigels being made in Beigel Shop. They also have a wider selection of sweets and pastries, the chocolate eclairs are to die for. 4. The reason that is swaying most people at the moment is that the Beigel Shop are now baking their very own rainbow beigels, made famous by the Bagel Store in Brooklyn New York. Of course these are total novelty but they are simply stunning and they do have a slightly sweeter taste that I love. All you need is a dollop of cream cheese to achieve perfection. In short anything from the Beigel Shop is a win, the classic hot salt beef is delish, as is the smoked salmon and cream cheese. I guess it all boils down to a matter of opinion, but having sampled beigels from both, its the Beigel Shop all the way for me! Its cultural importance in the area makes it a long standing pillar that I hope will never be pushed out by the increased commodification of this vibrant area. It's also one of the last places with truly affordable prices, for decent food. Salt beef bagel that's all I'm saying. Everyone seems to have a favourite beigel shop on Brick Lane and for most people it's Brick Lane Beigel Bake (aka 'the white one'). Here's why those people are wrong. Britain's First & Best Beigel Shop (aka 'the yellow one') usually has shorter queues, the beigels are just as good and the lighting is way more flattering (this is very important at 3am). I've never shelled out for salt beef so I can't compare the Beigel Bake's signature dish, but I've been eating the Beigel Shop's own speciality – smoked salmon 'n' cream cheese (with lemon 'n' pepper) – for years and it's superb. But you just try telling that to the salt beef zealots steaming up the windows of the Bake every Friday night.